Valentine’s Day is almost here! If you are looking to buy your sweet-toothed sweetheart a gift they will truly appreciate, make sure to get the good stuff. Try some of these local chocolates, prepared right here in Indianapolis, IN and the surrounding communities. Help support your community and your chocolate cravings! Donaldson’s Finer Chocolates. Voted the 2014 winner for top chocolates by Indy A-List Donaldson’s Finer Chocolates can’t be beat this time of year. Made by hand with dedication to traditional chocolate making you can pick up your own box in Lebanon, IN or they also do online ordering on their website. The Best Chocolate in Town. Their name says it all, The Best Chocolate in Town, the town being Indianapolis, IN proper. In addition to boxes of truffles, caramels, and toffee, they also offer a chocolate of the month club. Keep the sweets coming to your sweetheart all year round! Louise’s Sweets. Another local favorite in Indianapolis, IN is Louise’s Sweets. Their motto is “Your Taste Buds Will Thank Us” and they are right! The hand-crafted chocolate and gifts are spectacular and they also specialize in other baked goods and cakes. I hope you have a wonderful Valentine’s Day with your loved ones. 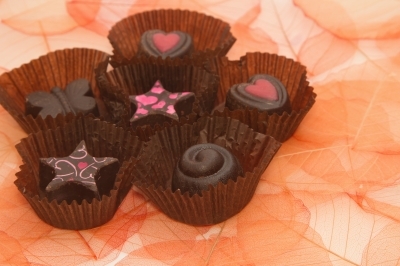 Hopefully one of these chocolates will make your sweetheart smile. If you are traveling into Indianapolis, IN to celebrate and are interested learning more about what this great city has to offer please contact an Indianapolis, IN real estate agent. As Indianapolis, IN real estate agents, our services extend beyond helping Indianapolis, IN homebuyers and sellers through their transactions. We thoroughly enjoy getting prospective residents familiar with their surroundings and exposing them to the best of everything this area has to offer. We hope to speak with you soon!